Although I could reach back into my embroidery past and write about some of my cross-stitch work, I thought I’d try and write a little this evening on what I am working on at the moment. The first module of the R.S.N.’s diploma programme, is that of Appliqué. It is a mandatory requirement to begin the diploma with this module, and pushes traditional embroiderers outside their comfort zone. Why is that? Well, Appliqué is a very different technique from those learnt for the certificate programme (more about that in upcoming posts), as the embroiderer’s main focus is not using thread and needle to employ stitches which will make up an image, but applying fabrics onto one another in order to create a work. The term comes from the French “appliquer”, meaning to ‘apply’ or to ‘put on’. More about the technique can be found in Kate Cross’ RSN Appliqué, Techniques, Projects and Pure Inspiration, ISBN 978-1-78221-188-4. The first step is to choose an image which will guide the design. As I am starting out, I’m not yet ready to come up with an original design, so an established image is chosen to reproduce. Whilst researching images, I wanted to choose something that contained a bit of elegance as some appliqué pieces I perused reminded me of craft projects done at summer camp (the use of felt initially made me cringe). 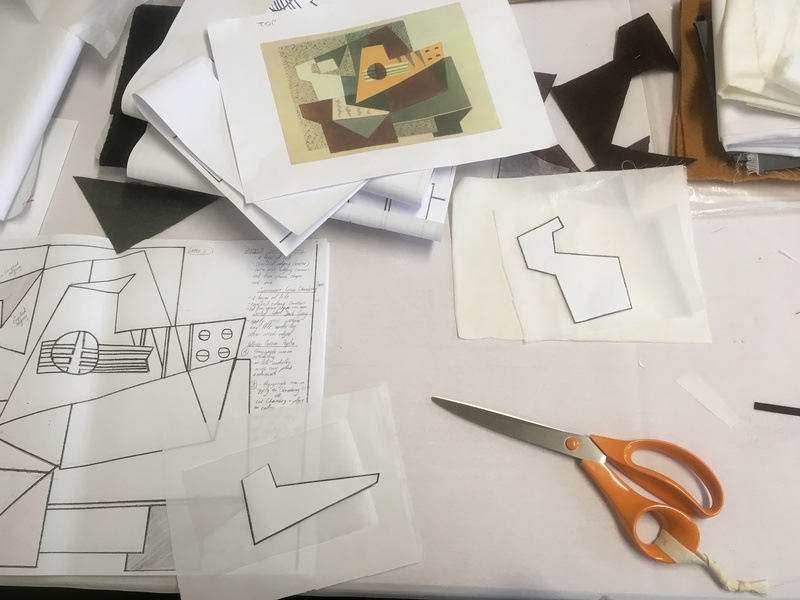 I eventually turned to the art world as a tutor at the RSN, Kelley Aldridge, suggested that a cubist or geometrically inspired painting would be a good starting point for my first appliqué piece. Once satisfied with the measurements, I made a number of copies in order to determine the various layers I would need. At the same time, I also had to determine which fabrics, padding, cords, edges and threads to use. This was not easy as I am not a regular sewer and could not count on endless drawers and boxes of scraps which could be used. I took a chance on a fabric website: https://www.dragonflyfabrics.co.uk/ to match up most of the pieces I needed. They sell smaller pieces of fabric and I was very pleased with what they had sent.